Today is the day, dear readers! Zoe, my quiet writer, gets her happily ever after with Erik, my quiet leader. They complimented each other in ways I didn't expect when I first started writing, but that's part of the fun of writing. No matter how well thought out your characters are, no matter how much you've plotted, once the words start flowing they take all your preparation and create something all on their own. Please check out the blurb and then grab yourself a copy! And please let me know what you think when you're done! 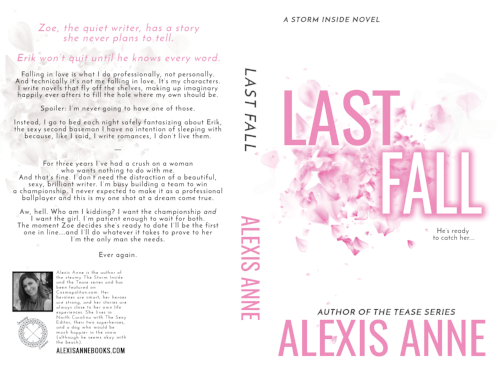 Last Fall is available in ebook (with the cover you see above) and in paperback. "Last Fall was a simply gorgeous slow burn of a romance! Erik is a caregiver by nature and his patience waiting for Zoe to become comfortable in her own skin and with him was breathtaking. As a reader, you know he wants so much more, but he places her well being first at every turn. I also really enjoyed watching his interactions with the team and his family . . . he really is a great big old Papa Bear! Zoe’s character is beautifully broken. She left an abusive situation and created a new life for herself. She’s got amazing friends and a very successful career, but is completely gun shy when it comes to going back into a relationship - especially with an alpha male of any kind. She refuses to feel owned or controlled again in any way, and rightfully so. Watching her learn to trust and open up to her feelings for Erik is like watching a flower bloom. This couple works so well together that even though it’s a slow burn, it’s an amazing tale as they find their way to one another. I also want to give a shout out to Alexis Anne for the book’s ending. When Zoe needs Erik more than ever, she gets so much more than she ever could have imagined - it is like something Zoe would have written in one of her own romance novels! 5 stars for this completely heartwarming romance!" The year is winding down and I'm looking ahead at 2018. Authors are always thinking about their next project and that's the topic of my Friday chat this week. So what will 2018 hold in romance? I'm hoping a new wave of romantic comedies that focus less on falling in love as the solution to life's problems and more focus on an improbable journey. One filled with laugh-out-loud but relatable moments, reminding us all of our humanity, and in the end, make us all really happy. I want the warm fuzzies, but without the sickening sweetness of too much fluff. Maybe I'm an outlier. There's certainly a massive following for the Hallmark channel. And there's nothing wrong with the fluff. If you like your romances fluffy, more power to you! But I like mine with some reality thrown in. I want to feel like just maybe this could really happen if the right ingredients mixed together. I want to relate to the characters and see myself reflected back at me. I'm not sweet or fluffy, but I do love a feel-good romance filled with funny moments. Dear 2018, can I have that, please?